I went on my first cruise when I was 20 and got hooked. I loved the excitement of cruising, being on the open ocean and enjoying the onboard food and activities. From that point on, cruising became an annual ritual in my family, and I would come back from each new trip actively recruiting my friends to come along on my next one. Most of my friends would tell you that I was a walking advertisement for cruising. After a while they would come to me for advice before they booked their own. Once I even created an entire itinerary for one of my friends for her honeymoon. They had a great time and I was super excited to be of help. I got into group cruise planning almost as an accident. I was a member of an online interest group and we all lived in different areas of the country. We would plan get-togethers in different cities throughout the year. Someone asked me if I would be willing to plan a group cruise for our next get together. I agreed and spent the eight months planning our group’s cruise. I researched the best cruise fares, itineraries and activities. The group made payments directly to the cruise line, and I acted as an intermediary. When everyone paid their deposits, I set up a Facebook page and kept the excitement level high leading up to the cruise. I posted pictures of the ship, information on flights and hotels, packing lists and general information that we would need. We had 17 people sail on that trip, so the cruise line offered us a free cocktail party and onboard credits that we could spend on items like drinks, pictures and souvenirs. For my first group cruise, I didn’t earn any money. The cruise line usually offers a free fare to the group leader for every 16 passengers that sail. My cruise line representative also sent a gift basket to my room to thank me for my work in planning everything. I later found out that I could make a commission each time I organized a cruise trip. The cruise line pays a percentage (varies by cruise line) for each ticket sold. The commissions are between 15% and 18% of the cruise fare. This commission doesn’t include the amount paid for taxes and fees. If a cruiser pays $250 for their ticket and $100 in taxes, the planner gets 15% of the $250, for example. 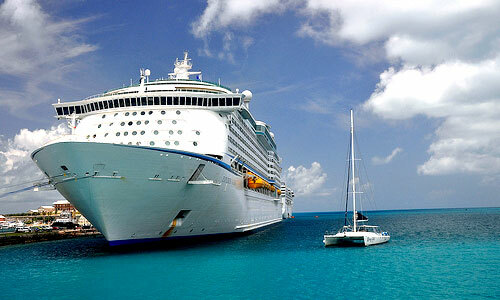 Spring break is a profitable time when it comes to group cruise planning. The work starts in September when students are returning to school from the summer. I simply rent a room at the three college campuses in my area, and then host what’s referred to as a “cruise night.” During the cruise night, I invite students to learn about a new upcoming cruise. I make a short presentation, show a video on the featured cruise and answer questions. At the end I invite the students to make a deposit on the featured cruise. The deposit amount ranges from $25-$100, depending on the cruise. I logged a total of 169 hours of work over the course of six months. This included setting up the cruise night, conducting research, answering questions and sending out information. This would be the equivalent of roughly $27 an hour. During the other months of the year, I concentrate on planning cruises for family reunions, church groups and hobby groups. In one month alone, I planned a cruise for a scrapbooking group, a 50th birthday bash and a photography club. It’s worth mentioning that the cruise lines don’t simply hand out commissions to anyone who calls in and asks for them. You have to be a registered travel agent or work with a host agency in order to earn commissions on your cruise sales. Becoming a registered travel agent can take years of training, so there are two easy ways to bypass this step. First, you can a travel agent in your area and offer to bring in groups for them. Make an agreement that the travel agent will pay a certain percentage of the fare of each passenger you bring in. This is the easiest way to do this. You don’t do any of the planning work. You simply bring in the groups and hand them over to the agent to do all of the work. Most agents will be more than happy to share the profits with you if you hand them groups of people ready to cruise. Travel agents have access to a wealth of free materials that you can use to promote your group cruises too. They can give you brochures, posters, postcards and images you can use on your Facebook page or blog. The second way to earn commissions on group cruises is to sign up with a host agency. These agencies are registered travel agencies that will allow you to use their industry certifications to plan your own trips. When you sign up with a host agency you are considered an independent contractor of their company. The benefit of this is that you earn more money. But you also have to do the planning work yourself. While some host agencies charge you a fee to use their industry credentials, there are others that you can join for free. The biggest benefit of group cruise planning is that you get to travel for free and get paid for it. The cruise lines will love you if you keep bringing groups of customers and will reward you with free rooms, onboard amenities and gifts. You get paid well for your planning and organizational skills. You get to cruise and see the world for free. The cruise industry is a multi-billion dollar industry and there are huge profits in cruise planning. Group cruise planning is hard work. You may spend hours taking phone calls, responding to emails, instant messages and text messages from your group. If you work a full-time job, you may have to conduct your group cruise planning in your free time. The work only gets more difficult as you get closer to the date of the trip. While you will be on vacation during your cruise, you will still be working. Expect to be the person everyone comes to with problems and issues. Group cruisers often prefer lower fare cruises, meaning the same amount of work for smaller commissions. In the cruise industry, the most common type of group cruisers are called “affinity groups.” These are groups of people who share a common purpose or bond. Fraternities, families and church groups are considered affinity groups. These are the best places to start searching for your group travelers. If you look hard enough, you will realize that there are groups all around you. Your high school alumni association, your college sorority, your family and your photography club are all great places to start planning your group cruises. If you can provide your groups with a memorable experience, they will come back to you year after year. Your group members all have families and groups they’re affiliated with, so you can easily have a steady stream of income by simply planning one great cruise. Alison Moxley is a full-time ghost writer and self-proclaimed queen of side hustles. She also works as a workshop presenter in New York City and is an avid cruiser. Have your own side hustle you’d like to share with us? Lemme know! Wow, what a great way to make extra money!! I LOVE going on cruises! Nice name – Mrs. Debtfighter! Love that. I have never been on a cruise but I’ve always wanted to. However, I’m kinda hooked on all-inclusive vacations right now! Wow what a neat side hustle! That’s a great idea to go to colleges to talk them up. Props!! What a great side hustle, though I imagine it takes a ton of work! I had absolutely no idea that you could make money from booking group cruises! This was a very informative post. I have only ever been on one cruise and it was to Hawaii. I enjoyed it, but disliked the getting sea-sick part, so I’ve decided that I like staying on land better, although I may give a cruise another shot somewhere down the line. I have to be honest, I thought the travel agency business was more or less going extinct because the internet has made things so easy and accessible. It’s nice to see that people can add value and make a little coin while doing it. Hey No Waste, travel agents have seen a decrease in profits due to the accesibility of the Internet, but group travel is one area that most people don’t want to tackle alone. It’s easy booking one flight or cruise on your own, but coordinating an entire family’s trip is a whole different animal. Luxury cruisers, destination wedding couples and seasoned travelers are big markets for travel agents. I am very interested in have you set up a cruise for me Ms. Moxley. If you could send me some info that would be greatly appreciated. Hope all is well with your family. Hey Tony! I would be glad to set up a cruise for you and your super wonderful family! My first cruise was in 2001 to Bermuda on Princess. The cruise organizer who planned that group cruise did such a great job in the planning that I was HOOKED on cruising for life! That is a really cool side hustle and something that I never really thought of. This is such a cool way to get to vacation for free. I didn’t realize the cruise industry did this. Also, I did want to add that you can find affinity groups in anything–I saw they do a low-carb cruise every year with guest speakers and special arrangements with food on board. They didn’t have the whole ship though which now makes sense. I suppose if you could arrange a large enough cruise with a certain interest, you might even be able to pay some of the guest speakers if need be out of your commission. That’s a good idea w/ the speakers. If you get enough people, you can get free rooms. You just offer the guest speakers a free trip and the ability to sell their books/downloadable materials. That is really interesting. I love hearing how people are making money in unique ways, and I definitely never considered this! Whoa, this sounds like tons of fun! I’ve never been on a cruise before, but I’ve always dreamed of doing so! Very cool side hustle! I love going on cruises! Only been to one so far but plan to go on more! What a cool side hustle! I love hearing about these ideas, so thank you for sharing. I’m going to suggest this to my mom. Our family loves to cruise. My mom planned out our last cruise, which was amazing, and she told me that she loves planning vacations. She hates her job right now and this would be perfect for her. She used to work at a college and I’m sure she could round up a bunch of students for spring break cruises. This article was easy to read and understand.Often Blog posts like this are full of a lot of fluff or written in code and often times string you along without giving any real information. This was very helpful. I’m a cruise & vacation consultant (aka travel agent). I’d like to work with you if you want to put groups together. I’m curious how you would book a room at a college campus? Hello Sheila! Have you found someone to help you with your birthday cruise? I would be happy to help you. Hello! What travel agents do you suggest to use for the group travel? I want to make sure that I will be paid my commission fairly, and not taken for a ride! Next post: Magical Genie Asks: Would You Gain 25 lbs to Wipe out ALL Your Debt?